This tutorial will walk you through the common tasks of saving the content of the panes. RadDocking cannot save the Content of the panes itself. It only remembers the properties of the panes, the groups and the split containers and the way they are changed. Tha Save/Load layout mechanism matches the SerializationTag of the saved pane with the SerializationTag of the pane that is already created. 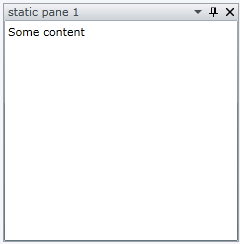 It works for the static panes, because when your application loads, the XAML parser creates correctly all the static panes and their contents. The dynamic panes are created by the RadDocking control and it doesn't know what content to put in them. You can save the panes' content by handling the ElementLoaded event of the RadDocking control and setting the content of the newly created pane yourself. Attach to the ElementLoaded event of the RadDocking element. The GetPaneContent() method needs to be implemented with the specific user custom logic.